When we talk about the Order, we assume that we are the Order, most of the times taking it for granted. But if we are the Order, it must be within us. If we become aware that we already are the ‘system’ but we don’t acknowledge it, the conflict remains. The ‘system’ in its various levels already exists inside us; we must just acknowledge it through the instruction and there is no point in activating it because it is already active. When we talk about the Order, we assume that we are the Order, most of the times taking it for granted. But if we are the Order, it must be within us. In other occasions, referring to occult physiology, it has been stated that the individual is an ‘ordered system' that exists by himself, beyond the consciousness (conscience of self) that he has of the ‘system'. When we talk about Order, then, we must consider that everybody is an Order in his own microcosm; therefore the Order is within us. And if it is within us, the action of acknowledging it in order to be able to manifest it in conscience is subsequent to one's own emanation of Order. Therefore we must start from ourselves, the stone ; we can't work on the stone if we don't know it. This is one of the access doors to the initiatory maize, an archetypical image and symbol represented since ancient times. The Minotaur (half man, half animal) at the center represents personality, Ariadne's thread is the soul and Theseus is the man who is going to free himself of the Minotaur, he's looking for initiation. The maize has only entrances and the only exit is vertical and central, where the Minotaur waits. Our maize is slightly more precise than the Minotaur's; our maize is made of Sephiroths. This Order, what kind of Order is it? And also: Know Thyself ; in order to work on ourselves we must work in the ‘system', but do we know the system? Ours is a Ceremonial Order, which has the purpose of Initiation gained through ritual operation. The fact that in its peripheral spheres it works for the benefit, support and help of the brothers, is part of the morale and it is normal, since we work in a chain, the ‘ chorda fratres ' where every link is connected to the other. But the core of the Masonic body is in the fact that it is a Ceremonial Order, which has the purpose of Initiation and works ritually, working under the particular energy which it takes its name from (of the Ceremonial Order or of Magic ), whose main activity is the spiritualization of the form. Like any other living reality, the energies involved are different; likewise it happens in Freemasonry, which in order to express itself as Ceremonial Order must be understood and it needs the intelligent Action that organizes the active forces of the Builders in line with the intentions of the Great Architect. This must happen on principles of Harmony and Beauty , which originate from the right balance between life and form, overcoming the conflict generated by the contact between creative and intelligent energy and the chaos of the matter that needs to be organized. If we become aware that we already are the ‘system' but we don't acknowledge it, the conflict remains. The ‘system' in its various levels already exists inside us; we must just acknowledge it through the instruction and there is no point in activating it because it is already active. In the ritual access to the Temple there are three things to learn: Rhythm, Cadence and Respiration. Here in the West we know very little about respiration and the strength of the body, what produces heat and fire. Until we learn what true respiration is, we will not be able to emit the sound; the latter can be ritual, geometrical and it produces precise effects. If we learn, using the physical body, to access the Temple with Rhythm, Cadence and Respiration, the result will be the highest concentration focused on the mental plane, which is already a good threshold where to start from. The work in the Temple , then, thanks to the ritual activity, helps to remain on this plane and to elevate spiritually (the particular feeling of wellbeing that many people experience with ritual activities comes from here). This happens because the psycho-drama that re-occurs with the ritual activity in the Temple leads the person who carries it out in a state of alignment of conscience, which is unusual in one's own daily life. It is also possible to stay in an inner alignment outside the Temple; usually who has acquired this ability is either a Yogi or an Initiate who has learnt to live in a state of continuous vigilant attention for long periods, even beyond the waking state, and he can maintain his alignment of conscience even in a situation of confusion or in an apparently unsuitable environment. Every work of initiation or that tends to initiation must be interiorly aligned. There is a special technique called Technique of presence , the Presence of the superior Ego in order to obtain an inner alignment. Therefore entering with a certain rhythm, cadence and respiration is the start of the Ceremonial Order that allows rituality. Interiorly our rituality is given precisely by rhythm, cadence and respiration, viz. physical alignment. This small key coupled with cyclicity – in the Temple the twelve pillars represent cyclicity, therefore we must learn rhythms and cadences of cycles as well as cyclicity – can be found in the works (for example the ritual must be read respecting certain times) and following the ritual cyclical order of the planet which – relevant point – is already aligned. This is the sense of Fulcanelli's studies, the sense of the secrets of the alchemy of cathedrals, the sense of the lines that join cathedrals forming constellations. All this, though, is still not enough to enter the Temple , since for the virtual access to the Temple we must have the need. The latter is depersonalized and it can be found in the chain of unification , in the chain of intentions, without which we enter separated, infringing the many suggestions that we've been given, such as the famous chord that joins all the pillars with knots; on an energetic level there are as many as the people belonging to it and they are all important. The chain of unification itself, the acts of creating it, becoming it and therefore being it, are called small initiation . The unification is in the common references and here appears the concept of hierarchy , which is a scale of values. The first reference we should find in Freemasonry is a moral chain , made of good intentions, good contribution and availability. The second one is a chain of ethical intentions , not only right relationships, or morale, but with the purpose of acting and operating for the wellbeing of mankind. Then there is speculative Freemasonry with philosophical intentions , communion of wise men that question themselves with the whys. Going up there can be a psychic chain – for example the Masters Essenes as well as Lamas (yellow berets rather than red) contacted each other telepathically, without the need to meet. The chain can then be energetic and finally animic . The last three levels constitute the true work of the Order. In order to start working at the construction of this chain it is necessary to enter a Temple visualizing inside and outside the building of it. This shows the quality of the chain but not how it can be obtained. In order to work on a psychic level we must develop the ability to work on the mental plane; like for any other faculty of man, it is necessary to have a continuous and consistent commitment in order to obtain results. On the occult initiatory level there are twelve senses and each of them is linked to a virtual quality that is an effect of the sense itself. Senses and qualities, listed in the following table, are not in a corresponding order; this is intentional, so that everybody has the chance to reflect and associate them. There are also the Eight Positions of the Initiate which, like senses and qualities, refer to the small initiation (Lesser Mysteries). This is the true work on the stone. It means to associate senses to qualities rediscovering them in ourselves. If the sense of Life didn't have compassion as a virtue, it would be pure egoism, therefore a centripetal rather than centrifugal Ego. As far as positions are concerned, Right Contemplation doesn't refer to a day or a planet because it should exist continuously. Right Contemplation is the right observation focused with the eye of the conscience through the mind. By conscience we don't mean morale, but the whole that surrounds and it is the true body of the system. Conscience is what comes from our soul. The contemplation of an object brings its penetration; true knowledge is penetration of the problem rather than its observation. We need to enter things in order to understand them; going inside is the sense of initiation, because until we are outside we are in the profane world. Therefore we have touched the core of the problem by saying that we must know the system where we are in order to use it; on the other hand we can't use the system if we are not aware of its rules. It is not enough to enter a Temple with the knowledge of rhythm, cadence and respiration; we also need a reason. This is the chain and among the various levels, we should start at least from the psychic one; to be able to face it we must at least be aware of our perceptions. In order to be aware of our perceptions we must set the mind in motion, without emphasizing it and training it, but using it as an instrument at the service of initiation, at the service of Service . Senses are perceptions and we must acknowledge them through the mind. Until we keep it busy in useful things, it can't damage us. It is a precious tool for work and understanding and most of all a precious instrument for communication, but it is not the king sitting on the golden throne. The basic energy in our microcosm, which is the man enclosed in the pentalpha, circulates in the following order (see picture below). Head, right foot, left hand, right hand, left foot, head (ethereal vehicle). 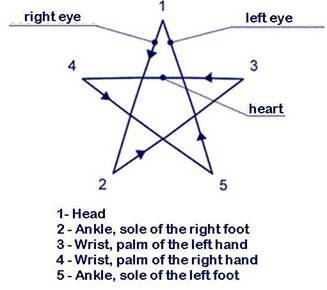 From the head, going through the right eye, it goes to the left foot, meaning ankle and inner sole, likewise for the hand we mean wrist and palm, from which it heads towards the other hand, going through the heart and, after touching the left foot, it goes back up to the head through the left eye. There are three positions: supine, prone or standing. By standing we have strength, vigor and most of all, the cardiac center is centered. In supine position we have relaxation and wellbeing. In prone position we have composure in the sleep and it is a very introspective position. I will hold the strength, which I brought after a complete round in the head, in the mind, if I think that I might need it before studying, before entering the Temple , before thinking. Or I can discharge it in the center that can be, in alternative, more useful. We can also discharge this strength in a metaphysical concept or in a virtue such as tolerance or in rhythm. To become aware using one's own inner senses is the only way that brings energy as focalization from the solar plexus to the cardiac center (Small Initiation).